After work today I headed straight to Barnes and Noble to pick up some books. I sipped my Starbucks beverage and leafed through the pages, making sure they were worthwhile purchases. This evening I got into bed, read my chronological Bible (loving it, but that’s a whole other entry), and opened up one of my new books. I exhaled, leafed through the pages quickly with my thumb, and took a nice long whiff. I’m a book smeller, aspiring to identify publishers by scent alone (I know someone who can do this). As I’m leafing and smelling, I see white pages with black writing rush by my eyes when all of a sudden – blue color. I go back and leaf through the pages again, this time with the intent of finding what this random blue picture was amidst all the black and white. To my surprise, I retrieved a laminated picture of a mountain with a poem written on it called “Climb till your dreams come true”. A girl (I’m assuming, the font was girly) I guess had randomly placed this poem in this specific book with the intention of paying it forward to a complete stranger. The poem was very sweet. Cliché perhaps, but nonetheless meaningful because it meant something to a complete stranger who wanted to make my day a little brighter. And that it did, because this small, serendipitous event made me smile and feel special somehow – like coincidence, fate, whatever you want to call it, chose me or something. She stated that she was not the author of the poem, but that it had made an impact in her life, and hoped it would have an impact on mine as well. This thoughtful stranger did not give me a name, but she did give me an email address. This situation reminds me of a line in one of my favorite songs by Leona Naess that says “I tried to rock you but you only can roll”. This particular stranger got the ball rolling, and now it’s up to me whether to rock it or not. Between keeping something so potentially great as this at a rolling standstill and rocking it, I’m rocking it! A friend from my church family got accepted into a graduate psychology program in southern Texas, which is totally sweet, but with a little bitter aftertaste to it. So last Friday night the young adults gang decided to throw her a little goodbye party to bless this next step she is taking. My dear friend Chantelle has witnessed several of my failed attempts to decorate cakes for different occasions. 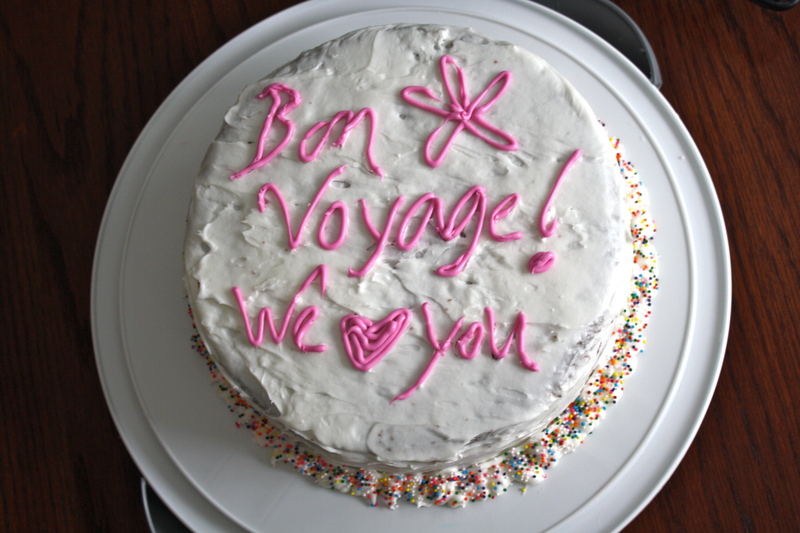 Nonetheless, she appreciates my efforts, and asked me to make a cake for this goodbye party. I had been thinking about trying to do some serious cake decorating for a while, and I realized that this Friday night event was my chance to make Betty Crocker, or Duncan Hines, or the Doughboy proud. “Aww, you are so sweet for trying”, but still proud. So I read, I researched, and I purchased some basic must-haves for cake decorators at Hobby Lobby. So here goes a detailed report on my first attempt at cake decorating. 1. I made the cake. Out of a box! No time for baking from scratch. 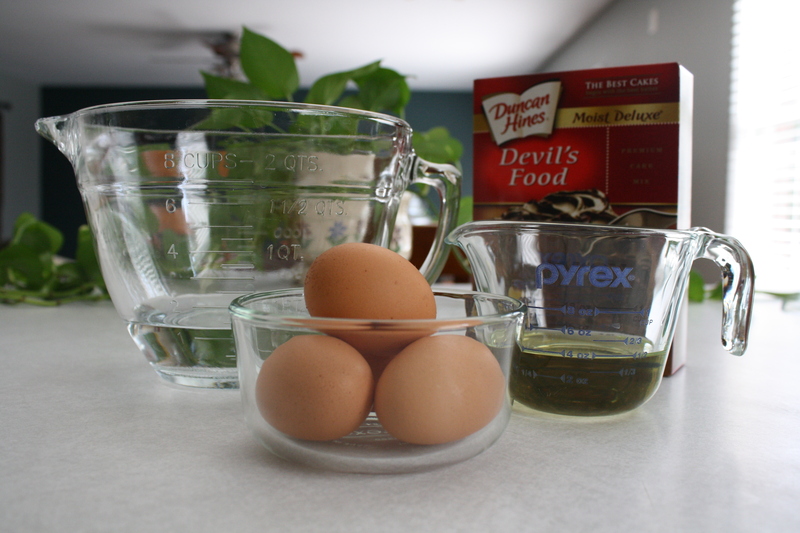 If you add one egg to the mix and 2 tsp of flour, the cake keeps it’s spongey quality but does not fall apart as easily. 2. After baking and cooling the cakes on a rack, I used a cerated knife to trim the cake tops to make them as flat and even as possible. 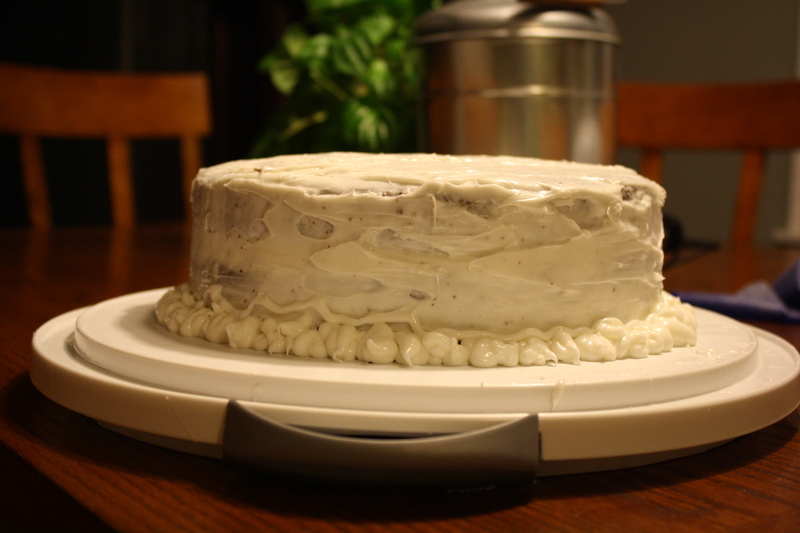 I put a generous dollop of (room temp) icing on top of one of the cakes, and spread it with my spatula from the center out, allowing the icing to drip out the sides. 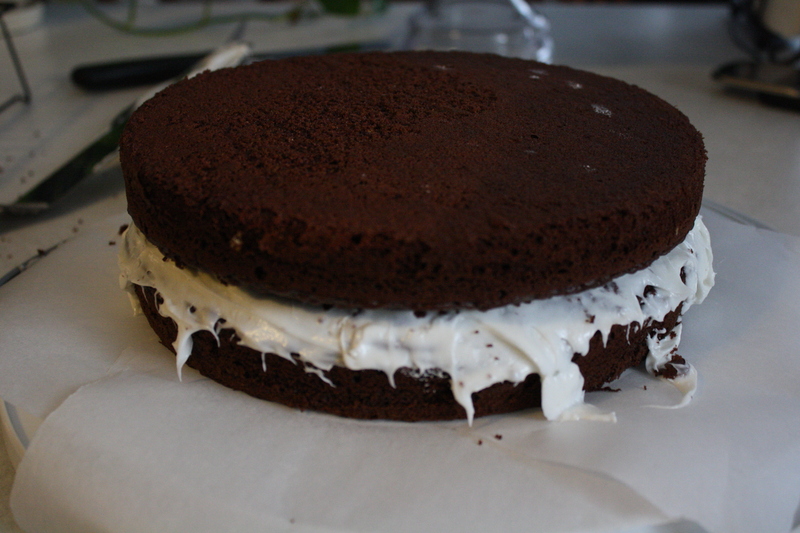 I then put the second cake wrong side up on top of the icing. Little pieces of parchment paper between the cake and the cake stand really helped me prevent some pretty ugly messes. 3. Crumb phase: vital. Mix about 1/3 cup of icing with 1 tsp of water, and pour icing on the cake. Let the icing spill down the sides. 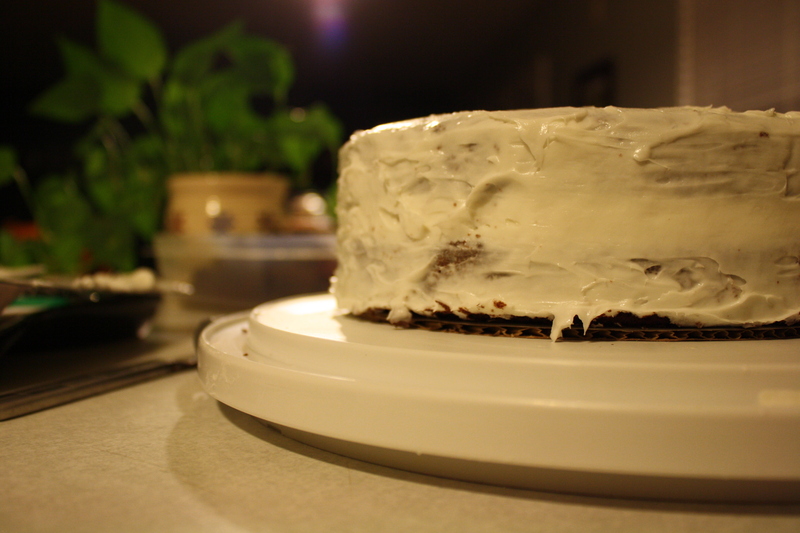 Smooth icing into a thin layer over the top and sides of the cake. 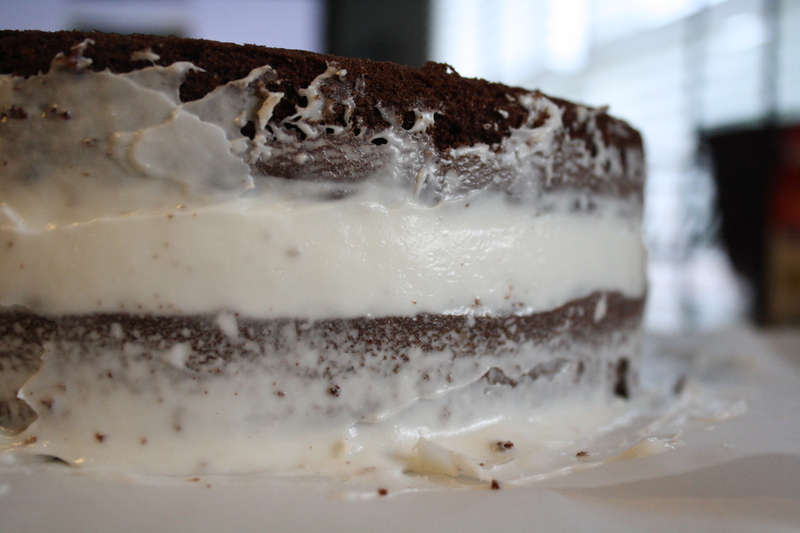 Make sure every cranny is covered between the two cake layers. 4. 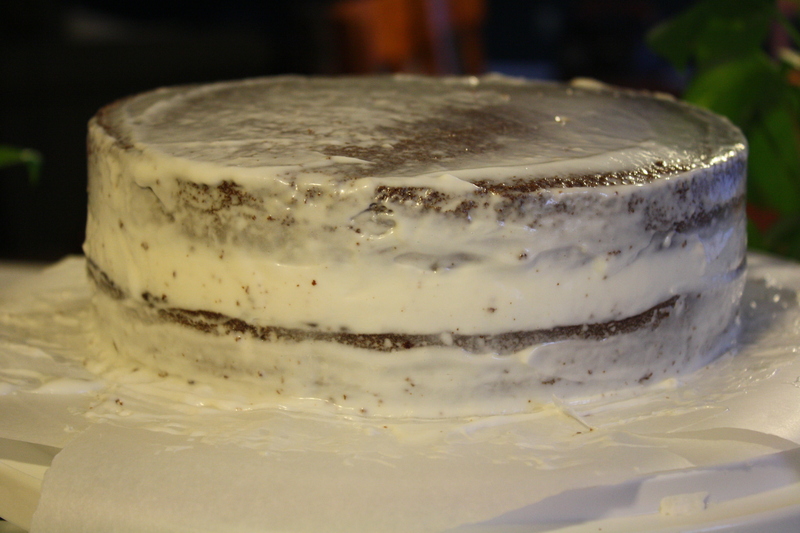 After letting the icing dry for about 30 minutes, I put a very generous dollop of icing on top the cake, again spreading the icing evenly from the center to the sides. 5. 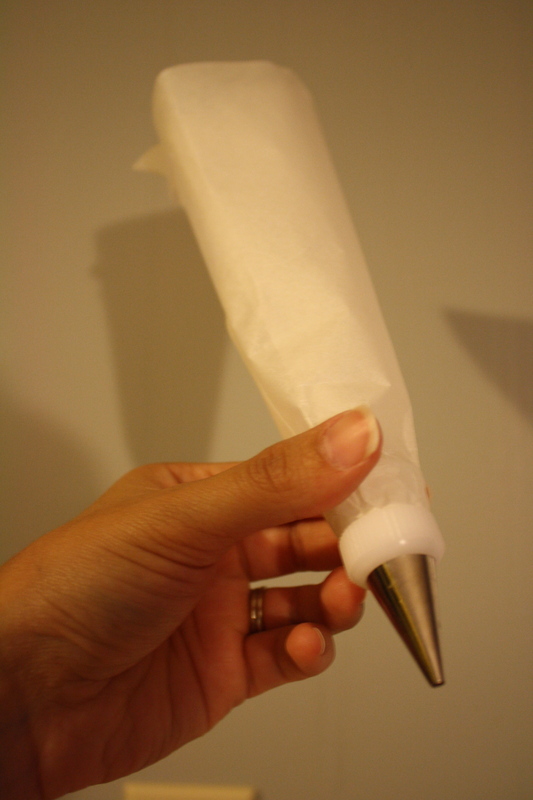 Once the cake was as even as I’d get it my first time (I’ll post the lessons learned from this experience at the end), I made my very first pastry bag out of parchment paper! 6. I could feel embarrassed for how messy the decoration along the sides looks, but I’ve decided to just be happy with my first attempt. 7. 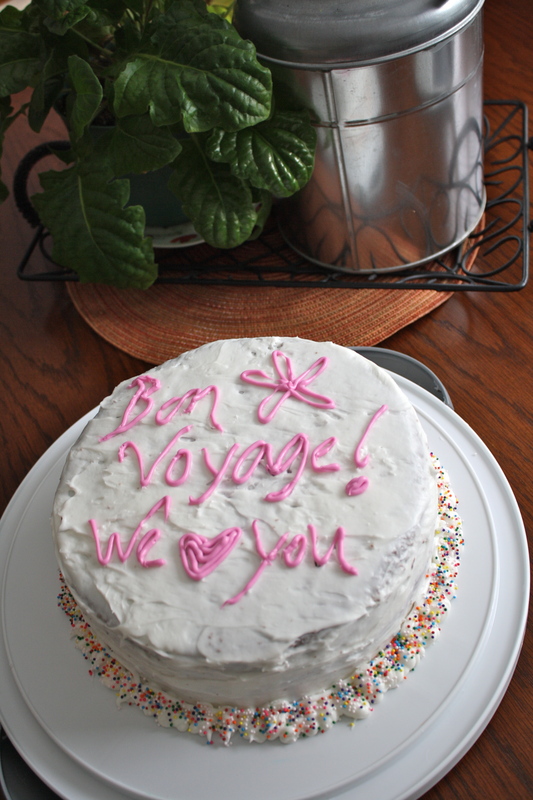 After adding some colorful sprinkles to disguise the border decoration, I tinted some chilled icing and wrote some heartfelt words on the cake. Not the loveliest, but it was from the heart for Elizabeth. It was eaten and enjoyed. 2. There’s a reason people made different cake spatulas for specific things. In my line of work it’s not uncommon to get asked very direct, random, and oh-you-are-so-close-to-being-inappropriate questions at times. I’ve been asked if I’m mexican more times than I can count. I’ve been asked if I speak mexican more times than I’ve been asked if I speak spanish. I’ve been called “little mexican girl”, “little indian girl”, and all too often my patients look at me incredulously and say “are you even old enough to be a therapist?” Within the last year or so, I have been asked if I’m philippine about 10 times (which never happened before). But within the group of patients that I’ve really gotten to know over the years, questions get a little more personal. They become a little more daring, a little more shameless in the things that they ask/tell me. For instance, over the past two months two different patients, at two different facilities, on two separate occasions, pretty much told me to stop twiddling my thumbs and have a baby already. All the other gentlemen sitting at the table chuckled, and then agreed. On another occasion, a sweet little old lady of mine let me know that, quite frankly, it’s time. She’s a devout catholic, and loves answering all my questions about her religion. Today in fact, she taught me all the about the process through which aspiring priests can become bishops aspiring to be cardinals. Just like that. It’s time she says. I’m just amazed at what my patients think of and feel totally at liberty to say. And this fact has lead me to the idea of compiling a book for myself of conversations, phrases, statements that have floored me for how witty, funny, ridiculous, nonsensical, and nondescript they are. What Cosby did, but with older adults. I know I’ve been slow updating this blog, but I have like 3 written drafts I’m working on simultaneously, and 3 other mental drafts fluttering through my mind. So I’m slow, but I’m sure. Last week I got to spend some great quality time with my family-in-law at the family’s lake house on Birch Lake in the beautiful state of Michigan. 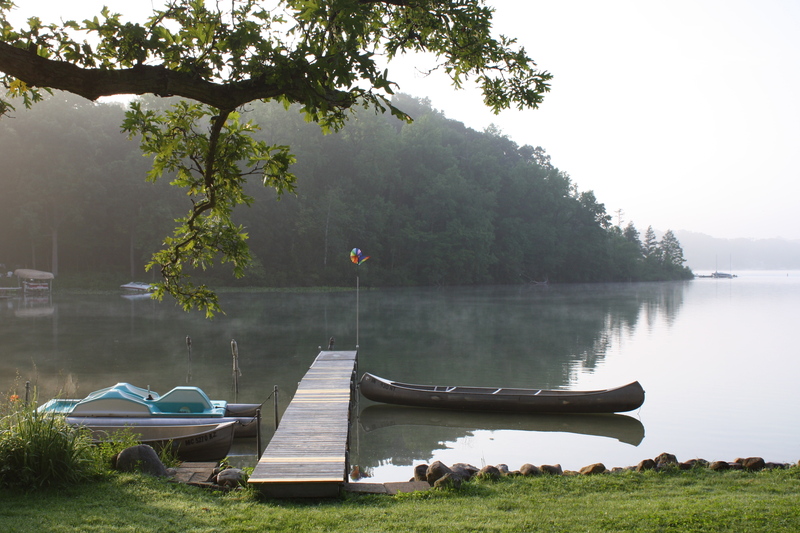 The lake house is located in a sleepy little cove called Turtle Cove. Well, sleepy until everyone decides to water ski and jet ski and joy ride. But early in the morning, before 9 or so, the cove is so sleepy and quiet. The only movement in the water is caused by a hungry fish, or a slight cool morning breeze. There is a thin layer of smoke on the water that makes me feel as though I just stepped into a fantasy world that I’ve only read about in books, or seen in movies (digitalized and graphically embellished). It is images like these that I retrieve from my mental file cabinet when it’s time to take a second, reflect on something good in the world, and face the madness again. I feel fortunate to be blessed with so many wonderful images and memories like this one to look at when I’m feeling overwhelmed with the strives of life (financial, career-related, relationship-related … you name it, that’s what I’m saying.) No matter your background or your life story, you know you’ve had those moments, seen those images, read those words, that just reminded you of what you want, love, and treasure most in life. I had no grand purpose in mind for this entry really, except to provide you dear reader with what helps me (and hopefully might help you) get through those days when the clock hands seem to move too slowly. What helps you get through hard times? I would love to know. Oh. And my apologies to all of you who were expecting a head banging accolade to Deep Purple. No fire in my sky.